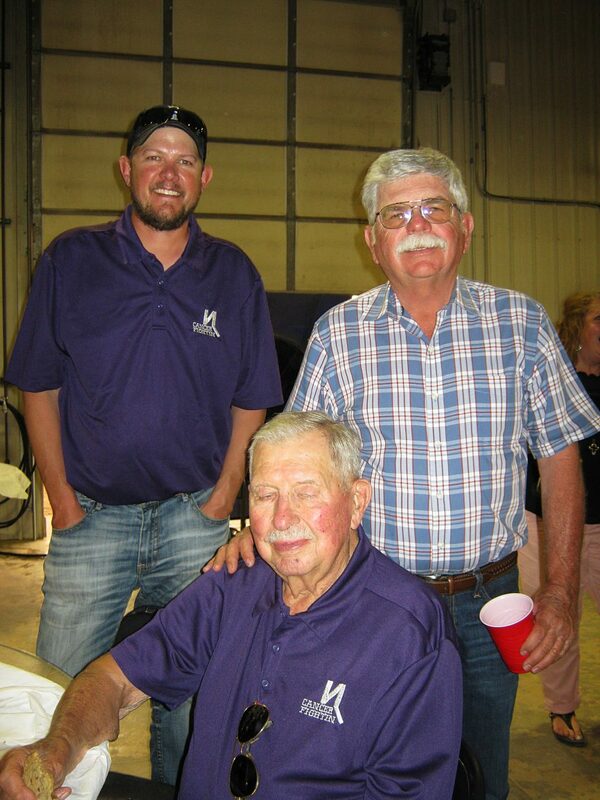 Platteville family hold largest Relay for Life event in Weld County, Colo.
Ryan Harding, Terry Wiedeman and Don Norgren at the Norgren's Relay for Life/American Cancer Society fundraiser event in Platteville, Colo.
BBQ for eight people by premier chef Jason Morse, 5280 Culinary, LLC. • Dawn and Chad Schafer bid $325 and won Rockies tickets and a certificate to Rodizio Grill. The Norgren family has been fighting cancer for 10 plus years through their Relay for Life/American Cancer Society fundraiser event in Platteville, Colo. Their large family of 80-plus members has had their share of cancer fights. Some won, some lost. Their matriarch Donna Norgren was the first fighter. “She was a survivor for many years. The cancer came back. She fought like a son-of -a-gun. We got involved with the American Cancer Society’s Relay for Life because of her,” daughter-in-law Dianne Norgren said. “We started doing the Relay for Life. We were very uncomfortable asking for money, so 10 years ago we had a family meeting and we thought about what else we could do.” said Don Norgren, the patriarch of the Norgren family. Steve Norgren (son of Donna and Don Norgren) had a BBQ business and had all the equipment they would need and knew how to cook. Ryan Harding, grandson of Don and Donna Norgren, had a cattle/farming operation near Platteville with a large shop big enough for the venue. With tight ties to agriculture in Weld County the rest of the family began to pitch in and organize with gusto. “It’s one of those things when it started we’re like we’ll see how it goes. It’s done nothing but grow every year.” said granddaughter Tami Norgren Arnold. “Involved” might be putting it mildly. Their 10th annual fundraiser, Ropin’, Ridin’ and Cancer Fightin’ held June 9 is the second-largest donator to the Weld County Relay for life for the American Cancer Society. Two years ago, they raised $20,000. The Northern Colorado United for Youth organization matched it bringing their total donation for that year to over $40,000. Last year they raised $17,000 and this year their goal was $15,000. They serve more than 200 participants dinner at $15 per person and have a live and silent auction following the dinner. Some of the auction items this year were Luke Bryan tickets, Rockies tickets with a gift certificate to Rodizio Grill, art work and a signed bat by Rockies player Charlie Blackmon. “The live auction can get pretty lively.” said Tami Norgren Arnold, granddaughter of Don and Donna Norgren. Tami has had her own fight alongside her husband who had been battling rectal cancer and is winning that fight. “Without the donors (for the auction items) none of this would be possible. It’s pretty cool to have the community relationship that we do that they don’t think twice about giving us the support that they do.” Tami said. The Norgrens began raising cattle in the Platteville area in 1954. “It’s a good place to raise a family,” Don Norgren said. The family worked extremely hard this year and raised over $20,000. Since the Norgren family began participating in the Relay for Life 11 years ago they have raised over $150,000. “Cancer effects more of us every day,” Steve Norgren said.